A powerful explosion struck a bustling upscale neighbourhood in New York injuring 29 people in what the mayor on Sunday described as an "intentional act" as police found a second explosive device nearby, a pressure cooker with wires, hours before world leaders descend in New York for the 71st United Nations General Assembly session. 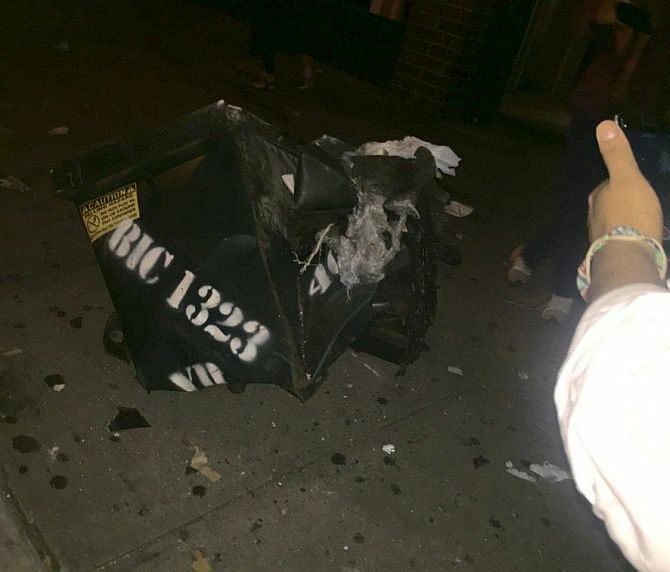 The explosion -- which happened shortly after a pipe bomb went off in a garbage can in New Jersey -- occurred in Manhattan's Chelsea neighbourhood, a busy residential and commercial area frequented by tourists and city residents. The impact damaged windows of nearby buildings and cars and sent crowds running from the scene. The blast seemed to shake the entire block, sending debris into the street. There were no immediate claim of responsibility for the blast that occurred at 8:30 pm local time on Saturday, a busy time of the weekend for over 8 million New Yorkers, who just marked the 15th anniversary of the September 2001 attacks. Police said they have a surveillance video from the scene, but it was too early to give out details except that the explosion was caused by an explosive device in a dumpster. They were combing through the video that appears to show a person near the site of the blast, in an attempt to determine if that individual is connected to the blast, CNN reported. Other reports said the second device was a pressure cooker resembling the one used in the deadly Boston Marathon bombings in 2013. Governor Andrew Cuomo said all 29 victims have been released from hospitals. Many of the injuries were caused by shrapnel. He told reporters that 1,000 additional New York State Police officers and National Guard troops will be deployed to patrol bus terminals, airports and subway stations. The deployment is "just to err on the side of caution," he said. "I want New Yorkers to be confident when they go back to work on Monday that New York is up and running and we're doing everything that we need to do." "There is no evidence of an international terrorism link and no reason to believe there is any further immediate threat but the bottom line is whoever placed these bombs we will find them and they will be brought to justice and punished. Period," Cuomo said. "(But) it depends on your definition of terrorism. A bomb exploding in New York is obviously an act of terrorism, but it's not linked to international terrorism," he said. New York City Mayor Bill de Blasio called the blast an "intentional act" but he too said there was no evidence of a terror link at this point. "We are not going to let anyone change us, intimidate us." He said the city "experienced a very serious incident" but there was "no specific and credible threat at this time from any terror organisation." Authorities said "extensive search" is being conducted in the area. Security was already tight in the American financial capital as nearly 190 world leaders are to arrive in the city for the nearly week-long 71st UN General Assembly session. Cat Hess was on 22nd Street between Seventh and Eighth avenues when she heard the explosion. "I had my windows wide open and it just sounded like -- you know when large trucks hit steel plates in the street? It was super loud, like a semi hitting steel plates," she told Huffington Post. "But this was extra loud. I was waiting for something to happen after, but there was nothing." A resident named Josh, who lives across the street from the dumpster, told local TV station NY1, "It was pretty forceful. We saw a big burst of light and it definitely shook us across the street." Josh added that his windows were intact but the windows in the building across the street, near where the explosion happened, were blown out. 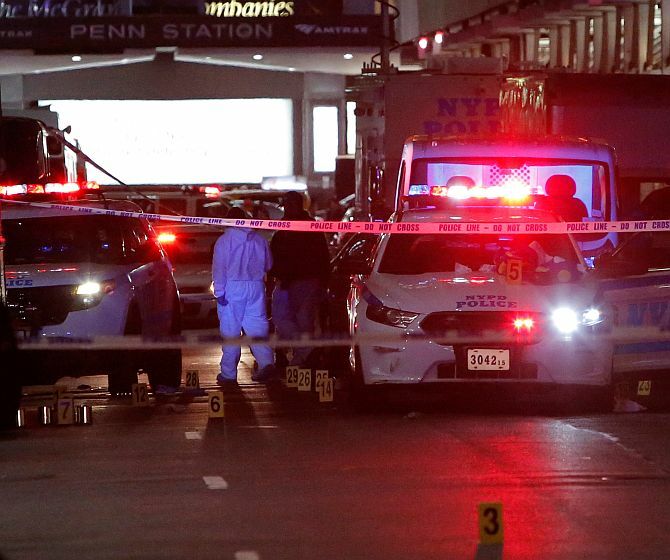 Javier Quintans, 33, a general manager at Francisco's Centro Vasco near Seventh avenue and 23rd street, said: "Just heard a loud boom in the restaurant and initially I thought something fell on our building," he told The Huffington Post. "People were going outside and I followed and realized it was something up the block. We evacuated all the patrons and now we were being told to stay indoors or leave the area." Deborah Griffin, a witness, told him she was shopping at Home Depot, seven doors away, when the blast happened. It was "real loud", she said -- her first thought was that it was a gas explosion. She described it as "like a volcano", she said: red at the centre, a wall of flames. "The explosion was so big -- people were running -- for their lives."